New parents, don’t miss this offer! 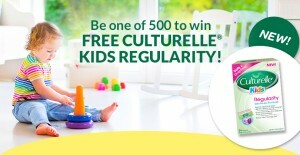 You can now get FREE Culturelle Kids Regularity Gentle-Go Formula! If you’re interested in this free package of NEW Culturelle® Kids Regularity Gentle-Go™ Formula, you only have to be one of the first 500 people to sign up! Just fill out your name and address information and the multiple-choice questionnaire and then hit the SUBMIT button at the bottom. They’ll mail the formula right to your door.